Society of Indian Automobile Manufacturers (SIAM) has released details of production and sales of various categories of vehicles for 2018. Growth in the automobile sector saw a notable increase over the past year. Production increased across all segments while domestic sales and shipments to foreign shores from India also maintained its pace. Overall demand of two, three and four wheelers, passenger and commercial vehicles saw a notable increase in production and sales. In the passenger vehicle segment which included passenger cars, UVs and vans, production increased from 39,61,327 units in 2017 to 40,64,774 units in 2018, a percentage increase of 2.61. During the same year in question, domestic sales in this segment stood at 33,94,756 a 5.08 percent increase as compared to domestic sales of 32,30,614 units in 2017. Exports in this segment however, dipped by 5.26 percent from 740,095 units in 2017 to 701,157 units last year. 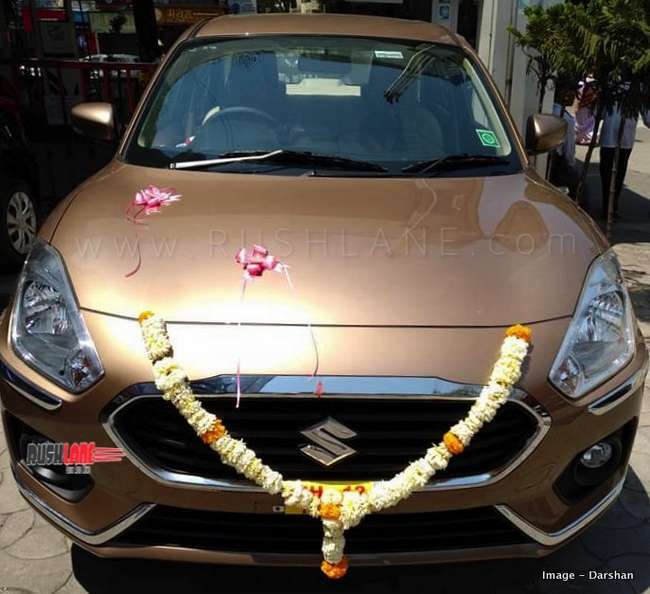 Maruti Dzire was No 1 car, Hero Splendor was No 1 bike in sales for 2018. Sales in the passenger vehicle segment were way below expectations. Even though sales started out on a healthy note in 2018, rising fuel prices in the second half of the year, increase in interest rates and one time insurance premium introduced by the Government of India, led to a dip in volumes in this segment while the festive season also failed to bring in any significant sales. In the commercial vehicle segment comprising M&HCVs (medium and heavy commercial vehicels), passenger and goods carriers, production surged 36.73 percent from 3,26,684 units produced in 2017 to 4,46,678 units produced the past year. Out of these, domestic sales increased 22.97 percent while exports went up 14.61 percent. Domestic sales which stood at 3,21,820 units in 2017 went up to 3,95,753 units in 2018 while exports increased from 43,583 units in 2017 to 49,952 units in 2018. The LCV (light commercial vehicle) segment also noted an increase in production and sales. Production of passenger carriers and goods carriers in this segment saw production of 5,04,220 units in 2017 which increased to 6,63,193 units in 2018, a 31.53 percent increase. Domestic sales went up 27 percent from 4,68,358 units in 2017 to 6,09,627 units in 2018 while exports increased 9.59 percent from 49,640 units exported in 2017 to 54,400 units in 2018. In the past year, a notable increase in production and sales of three wheelers were also noted. Taking passenger and goods carriers in this segment into account, production increased 42.07 percent from 8,77,917 units produced in 2017 to 12,47,250 units produced in 2018. Domestic sales increased 32.05 percent to 7,18,284 units in 2018 as against domestic sales of 5,43,928 units sold in 2017. Exports in this segment noted a marked increase by 55.96 percent. Exports in this segment, which stood at 337,629 units in 2017 increased to 526,559 in the past year. Vehicles such as scooters, scooterettes, motorcycles and mopeds also saw an increase in production, domestic sales and exports over the period 2017 to 2018. Production in this segment increased 14.88 percent with a total of 2,50,94,653 units produced during the January to December 2018 period as compared to production of 2,18,43,475 units produced in the same 12 month period of 2017. Domestic sales surged 12.84 percent from 1,91,82,668 units sold in 2017 to 2,16,45,169 units produced in the year ago period. Exports on the other hand noted a 22.87 percent increase. Two wheeler exports which stood at 26,52,273 units in 2017 increased to 32,58,883 units in 2018, an increase of 22.87 percent. It was even quadricycles that saw much demand, though most of it in global markets. Production in this segment which stood at 1,360 units in 2017 increased 209.19 percent to 4,205 units in 2018. Domestic sales were negligible in 2018 at just 178 units, however, sales in global markets went up from 1,308 units in 2017 to 4,049 units in 2018. 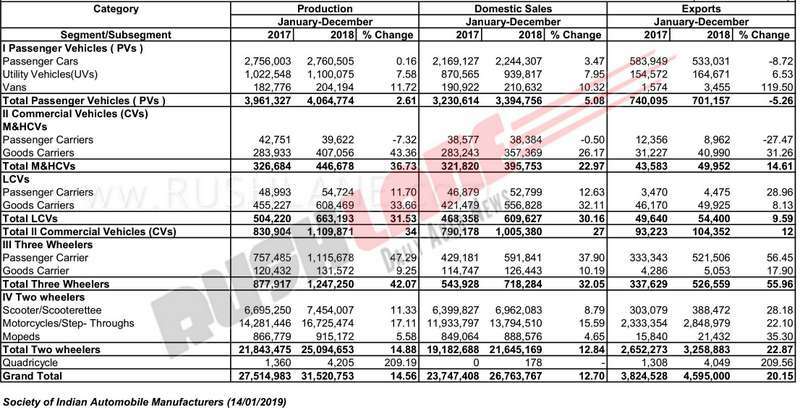 These sales figures took total production to 3,15,20,753 units in 2018 as against 2,75,14,983 units produced in 2017, a percentage increase of 14.56. Total Domestic sales through the year increased 12.70 percent from 2,37,47,408 units sold in 2017 to 2,67,63,767 units sold in 2018 while exports increased 20.15 percent from 38,24,528 units exported in 2017 to 45,95,000 units exported in the past year.